"We've rejected this turkey two times already and we don't want it." So said members of the editorial committee at Warner Books in the late 1970s. And they weren't the only ones issuing a thumbs down. The "turkey" in question — a manuscript by writer Jerry Hopkins — had already been shopped to and rejected by more than 30 publishers in the U.S. and U.K. Then a man named Danny Sugerman stepped in. Sugerman added his own material (a foreword, some anecdotes), assembled some photographs, acquired the rights to some song lyrics, and merged two of Hopkins' drafts. It was now a manuscript that Jerry Hopkins agreed to have co-authored with Danny Sugerman. And when editor Marcy Rudo of Warner Books got behind the book, a deal was made: Warner agreed to publish Hopkins and Sugerman's work, and it went on to sell in the millions of copies in more than two dozen languages. … And to find out what, be at Burke's Book Store on Thursday, May 16th (5:30 to 6:30 p.m.). 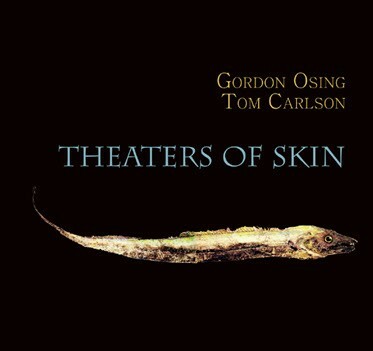 That's when the co-authors will be signing their latest collaborative effort: Theaters of Skin (Spuyten Duyvil Press), a book that combines Osing's poetry and Carlson's artwork. Osing will be reading from the book at 6 p.m., and, though he's retired from the University of Memphis writing program, he's continued to publish his poetry widely. Carlson, retired too from teaching in the U of M's English department and creative writing program, wrote of the fishing life in Hatteras Blues a few years ago, but he's also engaged in printmaking and collage. His artwork showed up in Osing and Carlson's La Belle Dame (also from Spuyten Duyvil), but it's gyotaku he's turned to now. The house at 1458 Vinton in Midtown Memphis may have been home for decades to well-known artist Dolph Smith, but before that, it was where Vince Vawter grew up. Vawter's book, Paperboy (Delacorte Press/Random House), is about coming of age in a city set to see some major changes too. The novel takes place largely in Vawter's Midtown neighborhood in 1959, and the first-person narrator is an 11-year-old named Victor Volmer III, who has taken on the paper route of a friend for the month of July. That newspaper is the Memphis Press-Scimitar, where Vawter himself once worked as a reporter before moving on to managing editor of the Knoxville News Sentinel and publisher of the Evansville Courier & Press in Indiana. That paperboy is a lot like Vawter when he was 11, but there's enough leeway in the story to make Paperboy fiction not memoir. Roam wasn't built in a day. It took time for Elijah McCallister, with help from the man he kidnapped out of China, to locate what he was looking for in America: mulberry trees. It took hard work too to carve out a settlement and build a factory — a factory to produce the sheerest silks — so that Roam the town could thrive for a time — a town, who knows where (or when) it is, but it's deep in the woods, with dark mountains and a dangerous ravine nearby and another town, Arcadia, miles away and down a road — the Silk Road — and there are miracle waters in a subterranean river and brute lumberjacks in the forest and a congenial but tiny man (don't call him a midget) tending the town bar and a lovelorn mechanic who can fix your broken car and there's every manner of magic to go with it, all of it. And now, only a few generations into its brief history, Roam is reduced to a few inhabitants. Vegetation is returning to reclaim the ramshackle houses emptied of families. Animals — deer and dogs and swallows — are returning to reclaim the streets and skies, but just as mysteriously they disappear too. All to leave Roam to the ghosts of the dead (there are many) and to those who survive — and among the living, two sisters, great-granddaughters of Elijah McCallister: Helen, who is 25 and hard to face, what with her off-putting looks and lying ways, and Rachel, who is 18, beautiful, and blind.